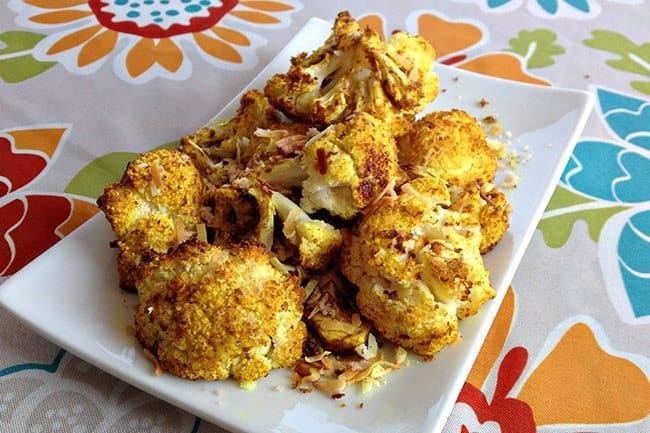 This Honey & Curry Roasted Cauliflower recipe is the bomb. I rarely, if ever, get excited about vegetables, unless it’s zucchini baked into something chocolate. The other day however, I found a way to cook cauliflower with curry that changed my world. <— no seriously, life altering for me. I rarely like any of the roasted and curried cauliflower recipes out there and I discovered why. Curry is a very flat spice on it’s own, unless you are picking up a multi-layered curry blend, in which then the taste is vastly improved. However the recipes that I have tried usually fall very flat taste-wise. Now, I am not talking about the curried cauliflower in Indian restaurants. No indeed, those beauties in the sauces are amazing! however, the key word is “sauce”. Calorie and fat laden sauces which of course, make the cauliflower delicious. I wanted healthy roasted cauliflower with a curry taste. 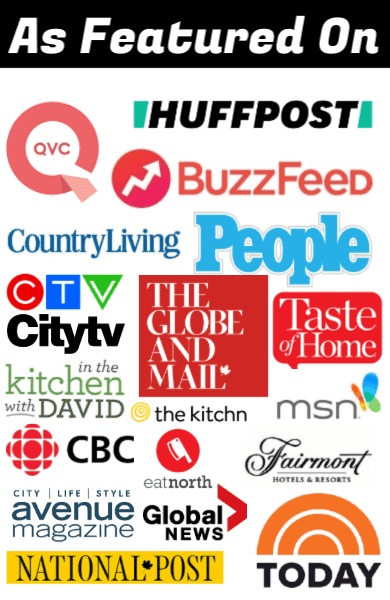 Being the kitchen geek that I am, I sat down to analyze what’s in the sauces that’s so great and then almost instantly knew anyway. The roasted cauliflower recipe needed sweetness to foil the savoury. Have you ever noticed when you are eating curries (the various sauces) how much taste depth there is? 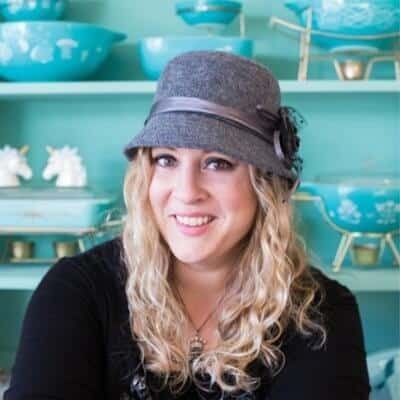 There is natural sweetness from the milks or creams used, plus sugar is also added in some recipes as well. So while I certainly had no intentions of sprinkling sugar on my cauliflower, there is nothing wrong with some beautiful, unpasteurized local honey! It’s totally good for you in moderation and this recipes uses SO little for an entire head of cauliflower, basically what I use in my tea or hot cocoa every day. Two tablespoons at the max! I also purposely do NOT coat the cauliflower with honey before baking since I want to retain the health benefits of the honey, which will be destroyed when you cook it at 450 degrees. Oh em gee, you guys, I ate half a cauliflower for lunch. Seriously. I added in the coconut because I absolutely love it, but you can easily leave it out. This is beyond a keeper recipe for me, this is a new favorite. Anything that gets me eating my vegetables like this is a winner. I hope you try it! Let me know what you think! 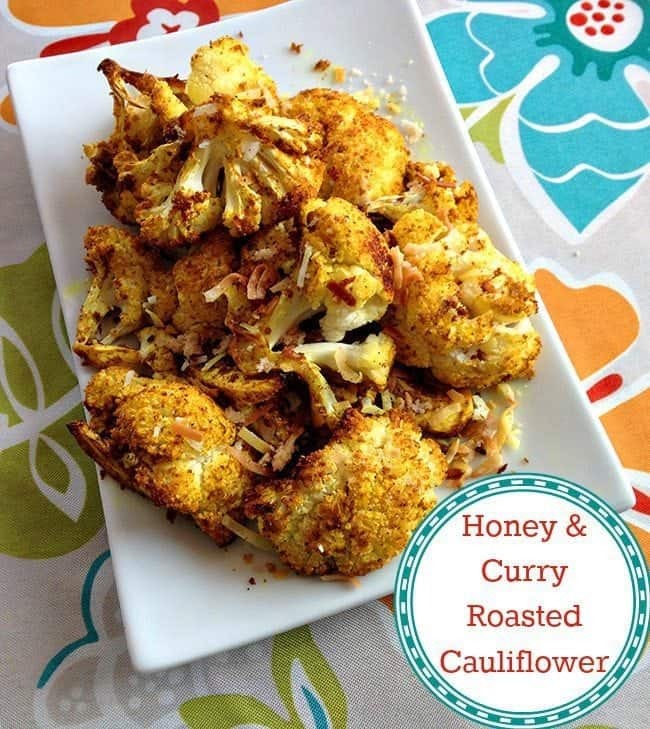 Sweet and savory honey & curry roasted cauliflower, the yummiest way to eat your veggies yet! In a large bowl, toss the cauliflower with the oil, covering it as much as you can. Add in the curry and toss to coat, making sure that the curry is on each piece, This is where you can adjust the curry amount to your liking. Put the cauliflower on to a non-stick baking sheet and bake in the oven for 15 minutes or until roasted to the desired consistency. Stir the cauliflower every 5-7 minutes, ensuring it doesn't burn. You can choose to either drizzle the honey over the top or return to a bowl and toss with the honey. Tossing it does coat it better but the florets might break apart a little. Sprinkle with sea salt and toasted coconut. This looks so good! I have some garlic fermented in honey and I will drizzle this garlicky honey over the roasted cauliflower pieces. Wonder if this method would work when roasting chick peas? Looks good. Let when I try this recipe. Looks amazing! I plan to try this out tonight. Re: curry powder, it is always a blend of several spices, but it can go stale/rancid very quickly and lose its flavour and vibrancy. That often happens with packaged curry powder. You can whiz some whole spices together in a coffee grinder (one reserved only for spices) in just a few seconds, and then the flavours will sing! One of my favorites from you site…..Yum! Hmmm, hmmm hmmmm. Love cauliflower and will give this a whirl! But I digress. Yum to this recipe. Can’t wait to taste it.